Oh man, I love these shoes. It wasn’t love at first sight, but upon wearing them, they are great! Shirt is H&M, skirt and shoes are J. Crew. I love my hair today! It’s my Khaleesi hairstyle for short hair. No eye makeup again, and I’ve been avoiding under eye concealer, too. Just one more week until my LASIK makeup restrictions are over! Necklace is made by me. I rode my bike to work today, and it was… an adventure. By the time I got to work, my Hunter boots were filled will water! Yuck. Fortunately my change of clothes (and hair!) stayed dry. How I feel about getting LASIK tomorrow. Nervous and excited. Necklace is some unknown brand chain. Dress is vintage DVF. I’ve lost a bit of weight recently (the munchkins I ate for breakfast today notwithstanding) so the dress fits noticeably different. Definitely not hugging my (lack of) curves the way it used to. Much more room in the waist, but that’s what happens when I lose weight; I get more narrow! I may have a causal outfit tomorrow. I’m heading to work but only have one experiment to run, then I head home and leave for surgery. Wish me luck! Ugh, another gross August day. I’m over it. Shirt is H&M. Necklace is made by me! I’m thinking of making it longer… Any opinions? My engagement ring! I wear it from time-to-time, but it’s delicate so I need to be careful. Pants are Ann Taylor LOFT, shoes are Lucky Brand. I got some good news today! I’m getting LASIK done on Wednesday instead of Friday. This way, my weekend is much less stressful. I just hope everything goes well! Until tomorrow! Happy Friday, all. Not much going on over here today. Dinner with friends tonight, lots of rest and relaxation tomorrow, and family time on Sunday. Shirt is very old… brand unknown. Gap khakis. 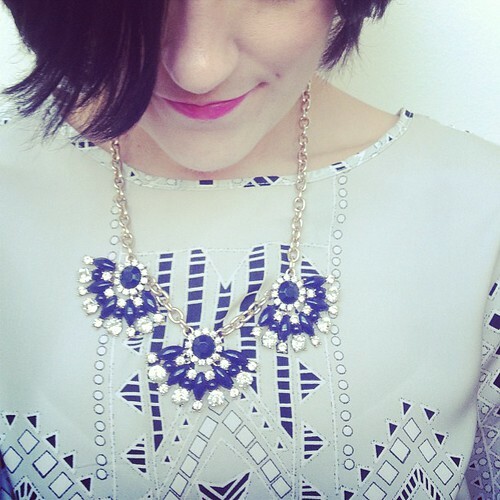 Necklace from Bauble Bar. Shoes are Aerosoles, and they’ve lasted at least… 7 years, so go Aerosoles! Ring is J. Crew. Oh. My. God, Becky. That zit is so big. Raaaah. This is one of the worst blemishes I’ve ever had. I haven’t picked at it at all, yet I can see that there are broken blood vessels all around it. So frustrating! I’m tired to wearing these glasses, too. Everything is awkward. And so are my photos! I was pissed that you could see my stupid undershirt in the best photo. GRR. Alas, this is all I have time for today. Oh Mondays! I’m just thankful my husband is a sweetheart and bought me a cappuccino this morning. We’re all having a blast! Cover up is an unknown brand that I bought at Ross. Bathing suit top is J. Crew and boyshorts are Victoria’s Secret. Coral necklace is made by me. Also wearing my heart J. Crew earring and ring with a leather bracelet I bought a million years ago at Urban Outfitters. Sunglasses are Fossil. Time to go sip on a porch swing and play games! Let’s blow this banana stand! Tomorrow, we leave for OBX. I cannot wait. This is about the time you notice that I don’t have a particularly diverse wardrobe, nor do I have the funds to change that. I spend about $40 a month on clothes. This dress, which you’ve seen before, was on sale last month for about $40, and so it was mine. The watch is Seiko. These might look familiar to anyone who knows me. I wear them a lot. J. Crew floral earrings. I am not the biggest fan of my feet and in general don’t like feet or pictures of feet, but went for it anyway. These are oldish, from Payless. Thought they worked! I’ll be posting some glamorous (hopefully not sunburnt) beach outfits soon!